Well, with my spinning/dying craze going strong, I managed to snag a Phat Fiber sampler box on my first try. It will be a mixed box with both yarns and fibers, and I look forward to trying them and doing a "little review" type thing for the contributors once I get into their samples. 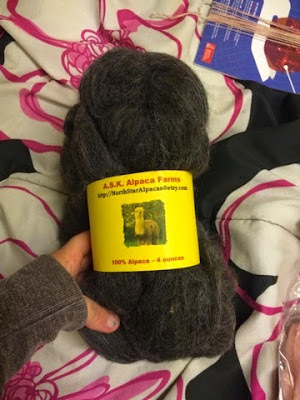 Speaking of which, I actually had never heard of Phat Fiber until I bought some amazing alpaca roving from North Star Alpacas a little over a month ago. 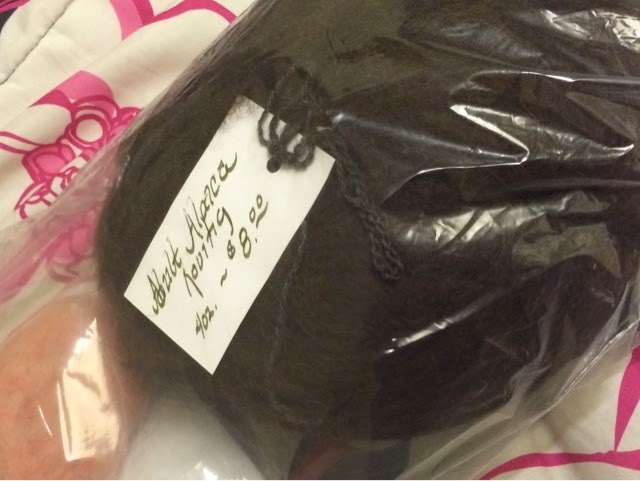 I first bought the cheapest thing I found- roughly 4 ounces of brown alpaca roving, priced low because it came from an older alpaca and the seller said it was rough for alpaca, similar to most sheep's wools. But, having just got into spinning and wanting some luxury fibers without the pressure of "don't screw up, this cost a pretty penny," I purchased it anyway. And I am glad I did. It turned out to indeed be roving- I had read the difference between top and roving but not quite understood it until I opened my alpaca roving and saw how it differed from the merino and colonial tops I had been working with. Left: unopened package. Right: Dyed, spun-up yarn. You can't really see it on camera- I tried- but it has a nice mottled purple look. 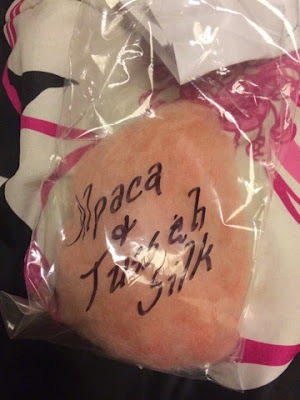 Plus, it came with a little moth-deterrent sachet and a sample of alpaca-tussah silk fiber! I spun that first and loved it. I have no idea why people said spinning alpaca was a nightmare, once I figured out it needed more twist that little darling spun itself! Left: one of the alpaca-tussah sample fibres. Right: I'm making a two-single ball to ply from. Left: the whole 4 ounces of roving. 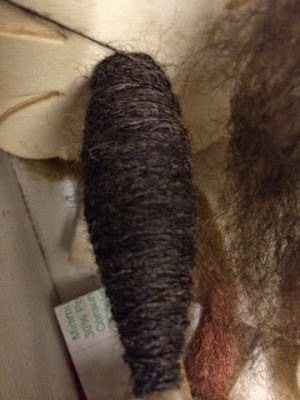 Right: The grey roving dyed purple. Hard to capture, but I promise it's a lovely stormy colour. So, I loved the purchases I made here. Do keep in mind however, that the listing photos are not super accurate of the product you get: they are a little washed out. The brown and grey rovings I got are both very rich, deep colours. 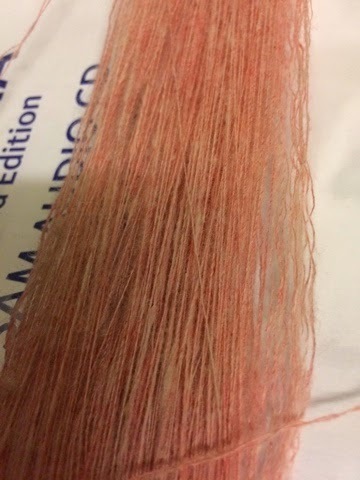 The alpaca-tussah sample does look closer to the listing photo, but more pink in real life. introduced me to Phat Fiber with the "thank you for buying" message! Will buy again, whenever I need alpaca! I'm already eyeing the fleeces in her shop! As for the first spindle shown, it came from Spinerosity and was very affordable, I will post a review soon. The second came from a local vendor who sells across the United States, Brookmore Creations. While I was adverse to the flower shape at first, it proved a good place for holding the yarn, not expensive, and a good beginner spindle for me.